Late October brings us to Week 5 of our Fall Color Reports for the North Carolina Mountains near Black Mountain, Asheville and Old Fort. Finally! 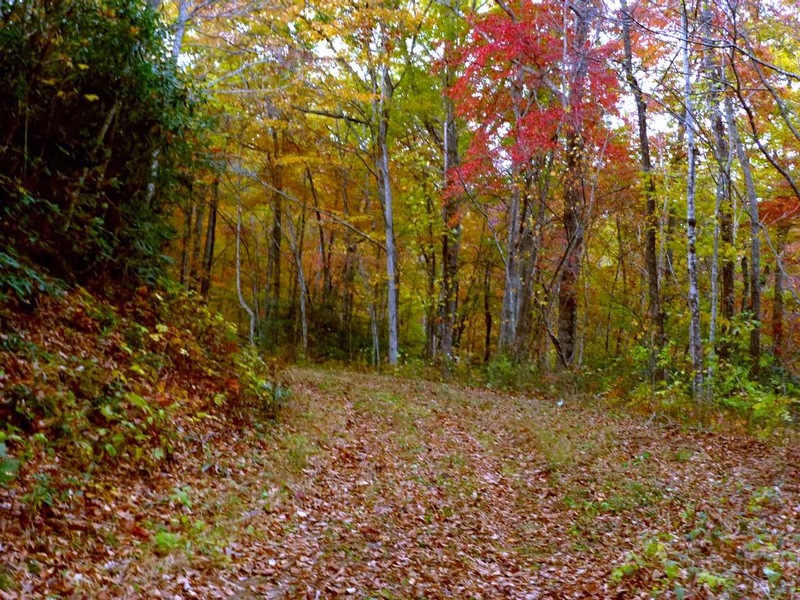 Mother Nature has turned up the color at our elevation of 2,300 feet inside Pisgah National Forest, three miles east of Black Mountain. A week’s worth of chilly nights — frost on two consecutive mornings! — has put a lot of flowers in the garden to bed for the year (see you next spring, hydrangeas). 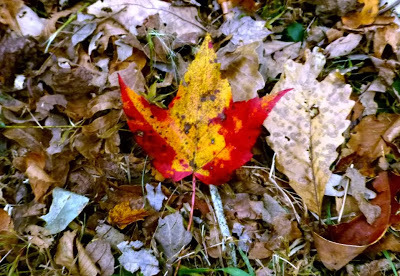 But it has also given the maple trees their mojo and just like that, we’re seeing brighter reds and oranges lighting up the roads and ridges. If you do decide to drive the Blue Ridge Parkway, which has elevations up to 6,600 feet, we recommend wearing layers and expect potentially wintry weather. After November 1, we let guests know each morning if any portions of the Parkway are closed. 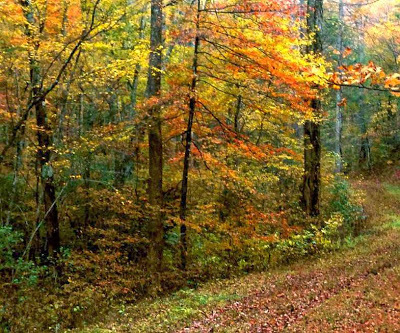 While some places along the Parkway, such as the Folk Art Center in Asheville, are open year-round, many visitors centers and attractions will close by November 1, and the road itself may be closed in large sections due to winter road conditions. Back in our neck of the woods, at elevations between 2,000 and 3,000 feet, we’re hitting our fall color peak a teensy bit late this year. 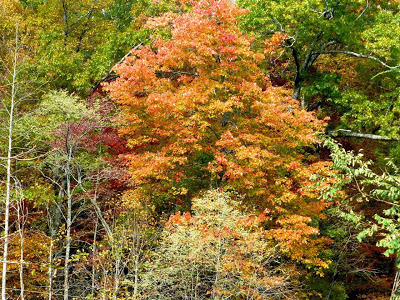 Tulip poplars are having another poor year, but beech, hickory, birch, sweetgums and sourwoods are holding their color, and as mentioned above, maple trees are really starting to shine, along with the sassafras trees. 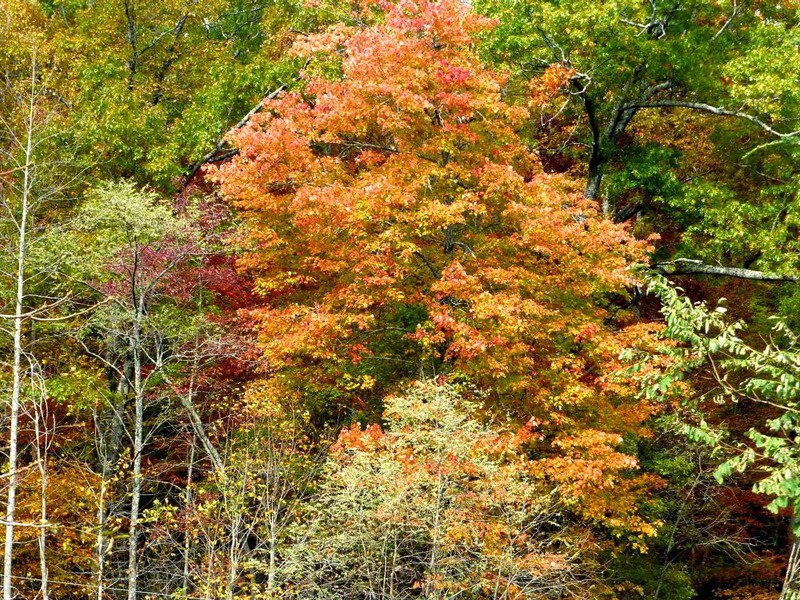 The oaks still seem to be holding out, so we expect some rusts and oranges to be coloring our ridges well past the first weekend in November. The Forest Service roads near the Inn on Mill Creek B&B: Pisgah National Forest surrounding the Inn on Mill Creek Bed & Breakfast is in full color right now! There are two access roads owned by the Forest Service that are gated to keep out motorized vehicles and they are great for a nature walk. One service road heads up along Bernard Ridge on the east side of the Inn, and the other meanders about halfway up Horse Ridge on the west side of the Inn behind our apple orchard. Both are quite lovely. And if you like geocaching, there is a Fire Roads series of several geocaches along both service roads. 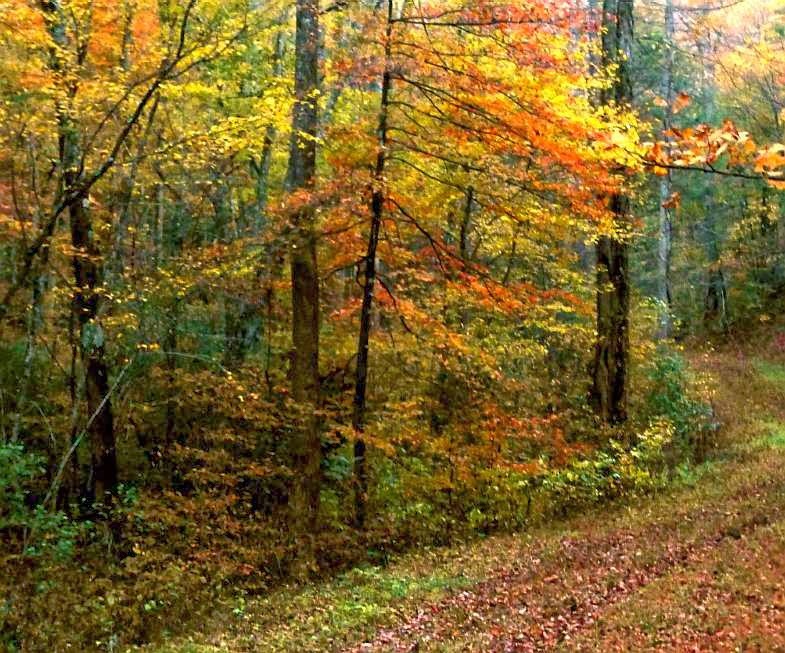 One note about hiking in the woods of western North Carolina: We do recommend that you wear something brightly colored if you are hiking during the daytime hours Monday-Saturday. Hunting is permitted in certain areas inside Pisgah National Forest. And while the woods immediately around the Inn are outside of the Pisgah Game Lands boundaries, the boundary line is nearby and you may see hunters parking their vehicles along the roads due to restrictions on motorized vehicles on forest access roads. It’s good for the hunters to know that hikers are there and vice versa. 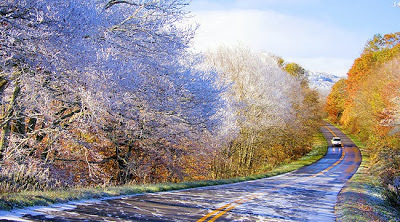 Biltmore Estate in Asheville: You know how we mentioned that winter and fall collided on the Blue Ridge Parkway last week? This week, you may feel twinges of winter setting in at Biltmore Estate, but it won’t be the weather that does it. Biltmore officially kicks off its annual Christmas celebration on November 1, with the tree raising ceremony in the Banquet Hall. Then, Christmas at Biltmore begins November 2. You can imagine how many thousands of decorations will grace the house and grounds at Biltmore and how much time it takes to accomplish decorating a 175,000 square foot house and 8,000 acres of land. 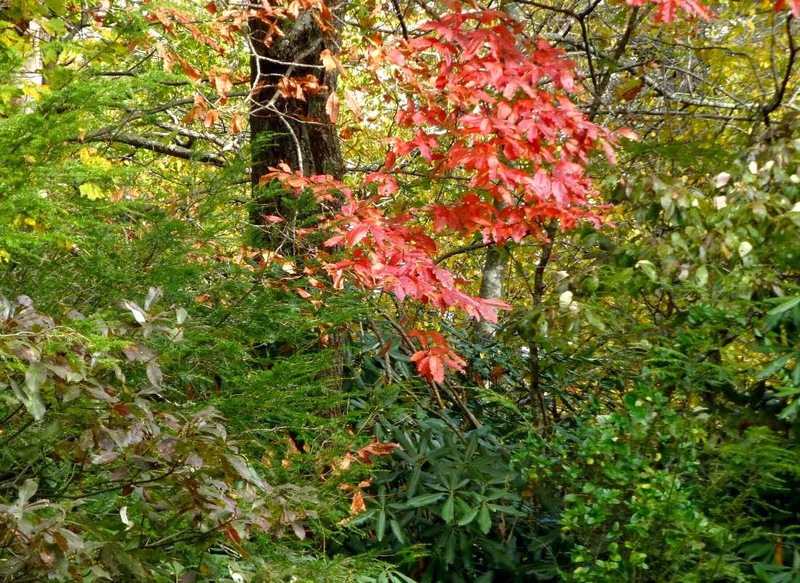 So visitors to Biltmore Estate in late October will see the makings of Christmas cheer, while at the same time having the opportunity to view beautiful fall colors provided by Mother Nature outdoors. We suggest the Architect’s Tour, a specialty behind-the-scenes tour of Biltmore House that includes a rooftop viewing experience, perfect for this time of year when the leaves are at their best. You can purchase daytime admission tickets for $49 as a guest of the Inn on Mill Creek and your tickets are good for a free second day. Specialty tours do incur an extra cost beyond the daytime admission price. 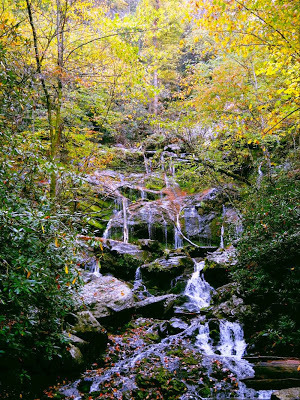 Catawba Falls in Old Fort: The trailhead for Catawba Falls is just 20 minutes from the Inn on Mill Creek B&B, in Old Fort. Leading along the headwaters of the Catawba River, the trail has been part of the protected lands of Pisgah National Forest for a little while now and it’s a great hike. 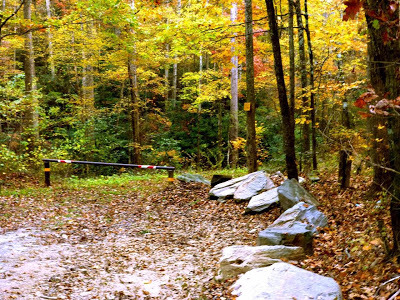 The trail leads to the bottom of Catawba Falls, pictured below. The hike is about three miles roundtrip and is mostly flat, but you will have to get your feet wet a couple of times crossing the Catawba River (more like a stream here since it’s the start of the river). Also, be careful of wet, slippery rocks and roots along the trail. And do not try to climb the falls. They are just as pretty from below! Stay tuned, more to come next week (and possibly the week after) as elevations below 2,000 start to reach peak. 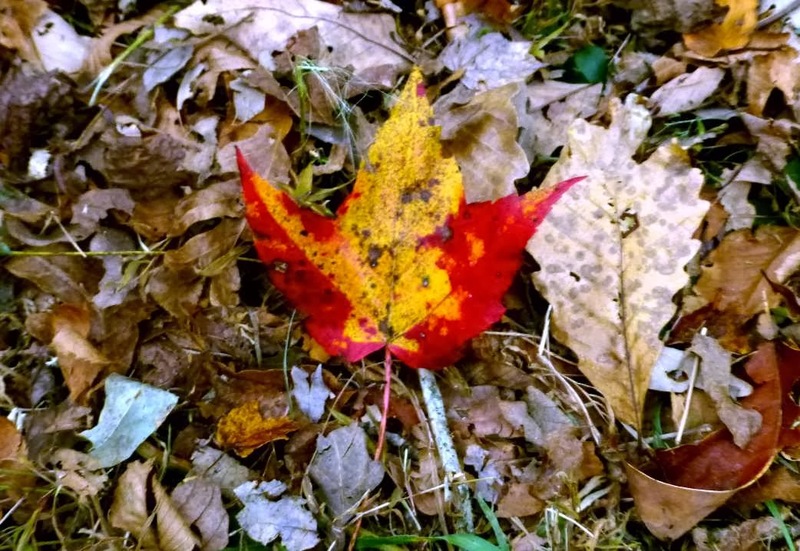 This entry was posted in Uncategorized and tagged Autumn / fall foliage, Biltmore, hiking, Old Fort / Andrews Geyser by Inn on Mill Creek. Bookmark the permalink.